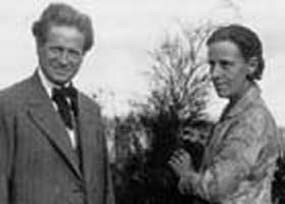 Walter Burley Griffin and Marion Mahony Griffin. Click here for material that has appeared in The Crag on the history of Castlecrag written by local historian Addie Saltis, and a detailed historical timeline prepared by Bob McKillop, Professor James Weirick and Elizabeth Lander. Walter Burley Griffin and his wife, Marion Mahony Griffin, are celebrated in Castlecrag for their contribution to the suburb’s development and to its community spirit. For many years, they were of interest mainly to a few specialised academics as obscure associates of the USA’s most prominent architect, Frank Lloyd Wright. Their lives and works have recently become much more accessible. Six books have been published since 1995. Documentaries have been made on them by Public Broadcasting Service in the USA and Film Australia and a very successful exhibition on their work was staged in Sydney’s Powerhouse Museum! Both of the Griffins came from the American Midwest, and their relationship began in Chicago where they were practising architects, Marion working in the office of Frank Lloyd Wright for 14 years and Walter joining that practice in 1902. Most of Walter’s work was residential and his role as an important “Prairie School” architect is now recognised. In 1912, in a collaborative effort relying heavily on Marion’s presentational drawings, Griffin won the international competition to design the Australian Federal Capital.The following year he came to Australia as its Director of Design and Construction. He was 36 and she 41 years old. While immersed in a seven-year struggle with the authorities over Canberra, the Griffins lived in Melbourne and worked on some important commissions including Melbourne University’s Newman College, the Capitol Theatre and the Cafe Australia. Of some 72 design projects there, 48 were completed. In 1919 Griffin formed the Greater Sydney Development Association (GSDA) and resigned all his Canberra responsibilities. Backed by Melbourne businessmen, politicians and personal associate, the following year he secured an option over a large area of the Castlecrag and Castle Cove peninsulas and most of Middle Cove (‘Covecrag’). Griffin described himself as a ‘landscape architect’ and these areas were not merely to be profit-making subdivisions, but examples of how to develop and build ‘model suburbs’ in harmony with the Australian bushland and local topography. Griffin designed the Castlecrag subdivision on a contour plan and the GSDA commenced selling blocks on the Castlecrag Estate, which previously had only two houses. The Griffins settled here in 1925. Most of the blocks in the Castlecrag Estate and the neighbouring Haven Estate had been sold by 1928, but the GSDA was not successful in inducing owners to use Griffin’s architectural services, to observe his covenants or to build. By 1932, with the Great Depression affecting the nation’s economy, over 40 houses had been designed, but only 19 had been built, 16 of which were initiated by the GSDA and its associates. The houses were, to say the least, unusual. They were ahead of their time in their orientation on the block to capitalise on views, their use of built-in cupboards, their flat roofs, their picture windows and their use of local sandstone in walls and monolithic fireplaces. By the late 1920s, with his architecture practice and professional esteem waning, Griffin helped form a company that designed and built municipal incinerators. Between 1929 and 1937, 13 incinerators were built to designs by Griffin and/or his partner Eric Nicholls, of which only five remain. One of the most outstanding examples is the Willoughby Council Incinerator near the Leisure Centre in Small Street, Willoughby. This incinerator is currently undergoing a $1.3 million restoration project. In 1935 Griffin accepted an invitation to visit India to work on a design for the Lucknow University Library. He filled a local need for an esteemed architect, and was given many commissions – some highly prestigious. In the following year, Marion joined him, leaving his partner, Eric Nicholls, to run the Australian practice. Some 100 design projects were completed in India, but only 5 were built. None remains. Walter Burley Griffin died in India in 1937, following surgical complications, aged 60. Marion Mahony Griffin soon returned to Castlecrag and during the next year retired to the Midwest of the United States. She died in Chicago in 1961, aged 90. Once in Australia, the Griffins were enraptured by its flora and soon were leading advocates for conservation. Walter wrote in the journal of the Wildlife Preservation Society that the landscape should be “accorded the respect due to a highly developed and perfected living organism”. By the time he began developing Castlecrag he strongly believed in “designing for nature”. Their principles were subordinating houses to the landscape, preserving access to and views of native bushland and being sensitive to natural features such as escarpments, creeks, rocky outcrops and established trees. The Griffin houses. Many have been altered, but they remain distinctive in their use of local stone or Griffin’s knitlock bricks, their flat roofs to minimise their impact on others’ views and their organic design – they are a part of, not perched on, their land. The street layout. The curvilinear roads follow the contours, unlike the regular grid pattern of neighbouring suburbs. Note the bush-covered “islands” at corners and in cul-de-sacs. The Haven Amphitheatre. Marion Mahony Griffin was the driving force in establishing this natural theatre on a corner lot in The Barricade. It was chosen for its acoustics and seating potential. The reserves and pathways. Griffin planned a system of recreation reserves connected by a network of pathways, designed to allow residents to ramble while staying off the roads. Individual topographical features suggested appropriate names, for example Tower, Buttress, Gargoyle, Retreat, and Lookout. The accessible waterfront. Griffin showed amazing foresight to put aside many kilometres of continuous foreshore as a reserve. Its creation without government coercion was unique. The Griffins’ creativity and contribution to society extended well beyond architecture. They wrote, lectured, invented, created wonderful artworks and laid the groundwork for a community with strong civic values. Building for Nature: Walter Burley Griffin and Castlecrag, Castlecrag, Walter Burley Griffin Society, 1994. Meredith Walker, Adrienne Kabos and James Weirick. Click here for Walter Burley Griffin Society website, which provides more detailed material on the Griffins and their legacy. To see more about the Fishwick house, one of the most famous, click here.